The tartan used to make the Northumberland kilt is believed to date back to Roman times. And as such makes it the oldest tartan known, preceding all Scottish tartans. It is the official tartan of the fifth largest county in North England. It is sometimes referred to as the "Falkirk tartan" as a fragment of the cloth was discovered in Falkirk around the third century A D.
But its more common names are "Shepherd's Plaid" or "Border Drab", as it was originally worn by shepherds in the borders area of the UK. The kilt is very distinctive, and looks unlike any other I have seen. Below you can see a photo of the kilt being worn formally, and it enables you to see how this unique kilt really stands out from the crowd. As you can see the photo was taken by Alex Cunningham, and I would like to take this opportunity to thank Alex, for allowing me to use his excellent photos, you will find a lot more of them sprinkled across the website. The tartan was originally woven using the natural fleece of black and white sheep, later such plants as the water flag and alder bark, were used to colour the wool. Below you can see a photo of the tartan used in the making of the kilt. 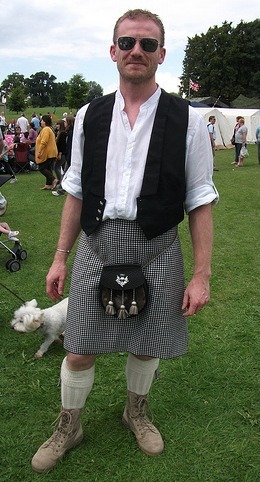 The next photo shows the kilt being worn casually, the gentleman wearing it is attending the Harpenden Highland Gathering. 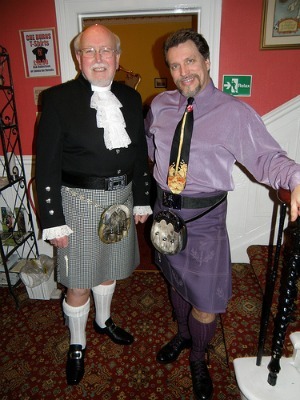 This photo is a good example of something I have often said, your kilt outfit is not a uniform, and therefor should be worn the way you want to wear it. Notice for example, that this gentleman has chosen not to wear a kilt belt on this occasion. The last photo for this page is a beautiful shot taken from the side, which nicely shows the pleating of the kilt, and clearly defines the checked pattern of the tartan. Notice how the Gentleman wearing the kilt, has gone to some length to colour coordinate both his kilt hose, and his sweater. 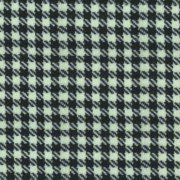 It is widely believed that Sir Walter Scott, who is credited with the revival of Scottish tartans and their association with Scottish clans, also helped to popularize this particular tartan by wearing a pair of trousers around London, made from this material. As this fashion craze took off in London society, the famous Border woolen mills were established, several of them are still in operation today. This particular kilt is also the official dress of the Duke of Northumberland's piper, and the pipers of the counties Regiment. It is a little known fact that such an important tartan historically speaking, belongs to a county in England. And its a county whose residents are rightly proud to wear, and be associated with this unique kilt.